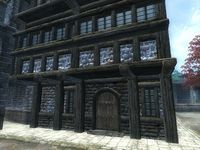 Shameer's House is located in Skingrad, opposite The Great Chapel of Julianos and next to Glarthir's House. From the entryway you can go left or right. To the right is the main living quarters. Shameer's house is sparse, and contains nothing particularly remarkable. This room contains only a cupboard of groceries, with bread, cheese, and some vegetables scattered about on shelves. There are four bottles of wine throughout the house, including one of Surilie Brothers wine, which may not please Shameer's employer. On the dining table to the left of the fireplace is a ham and an onion. Next to the table is a clutter crate with an iron war axe on top. You must go back out to the entryway to access the stairs, which are to the left of the front door. The second floor is the bedroom. Next to the bed is a small table with an iron dagger. The chests of drawers and cupboard here hold only clutter. The third floor has some items of interest. A locked chest in the south corner holds gold and some minor loot. A second locked chest in the east corner contains up to two iron or steel weapons, or fur or leather armor. The chest of drawers holds nothing of interest. This page was last modified on 27 August 2018, at 09:42.